Experience the coolest thing EVER. Did you know that the elephant population of Thailand has decreased over 85% this past decade? For a creature that is said to be so Godly, they don’t really treat it like that. Found out that the elephants have to go through some tribal ceremony that breaks their spirit, not to mention leaves them broken, scarred, and most the time blind from all the sticks hitting their eyes! It was sad to see the truth behind all the elephant tourist things. So when I heard about this sanctuary that rescues the hurt elephants and let’s them live in peace with other elephants, well this I had to see and support. The Elephant Nature Park was such a beautiful experience. 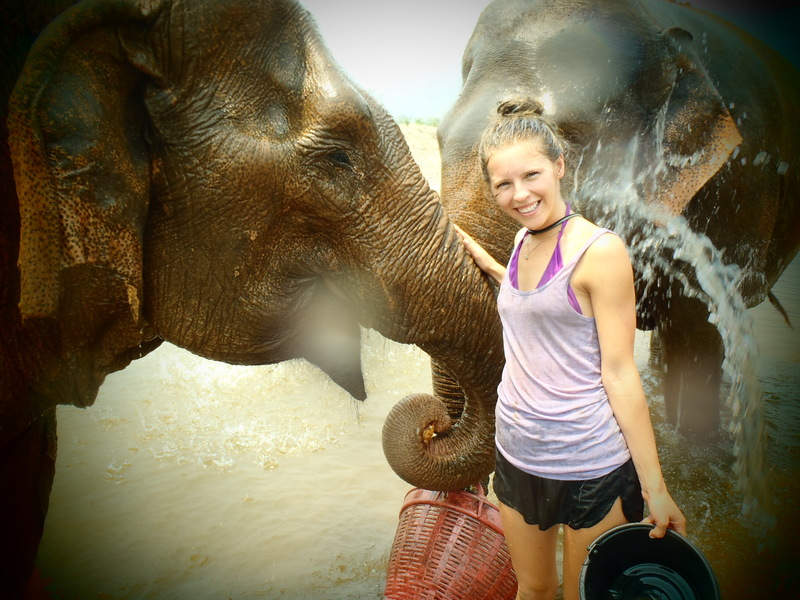 We basically went in a small group of ten people walking around the park just feeding and bathing elephants all day! There were 30 female and 4 male elephants who each had their own unique story and name. My favorite part of the day was bathing them. We all went to the river where the elephants were fed massive buckets of chopped fruit while we poured buckets of water on them. They made cute noises and moved their trunks in happiness. I am so happy to have done this instead of paid money to ride one around. Recommend doing this if you are ever in Asia…and they also do volunteer stuff so I may go back. Love this place. Currently looking into a slow boat through Laos, then Vietnam, Cambodia and ultimately back to Bangkok to consider lasik eye surgery. Jen…this sounds like a wonderful experience…so glad you are able to travel and see the world most of us just read about. …Uncle Gil..